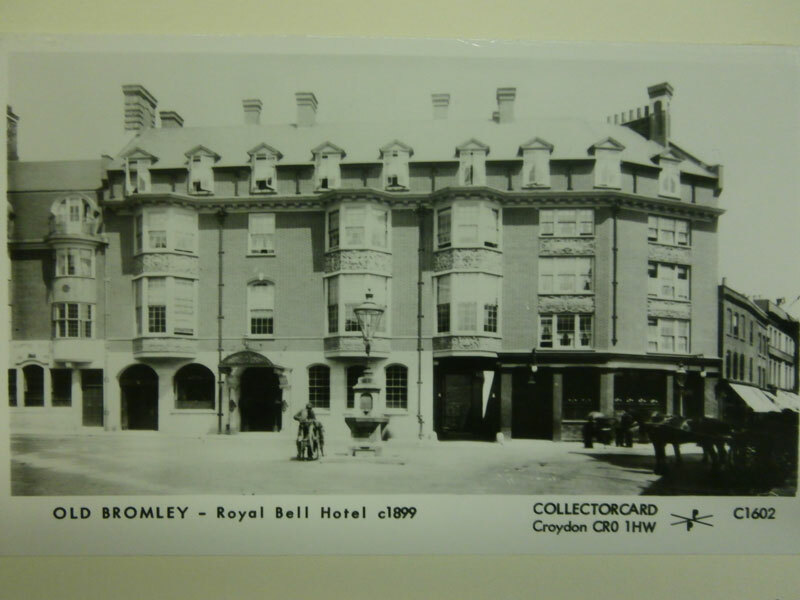 Plans to restore the Grade II-listed Royal Bell as a 5-star hotel in the heart of Bromley have been unanimously granted permission by Bromley councillors (subject to conditions). The building, which is currently on Historic England’s ‘At Risk’ register, will now be fully restored and extended, to house 50 luxury bedrooms, function rooms, a retail unit, gym and swimming pool. 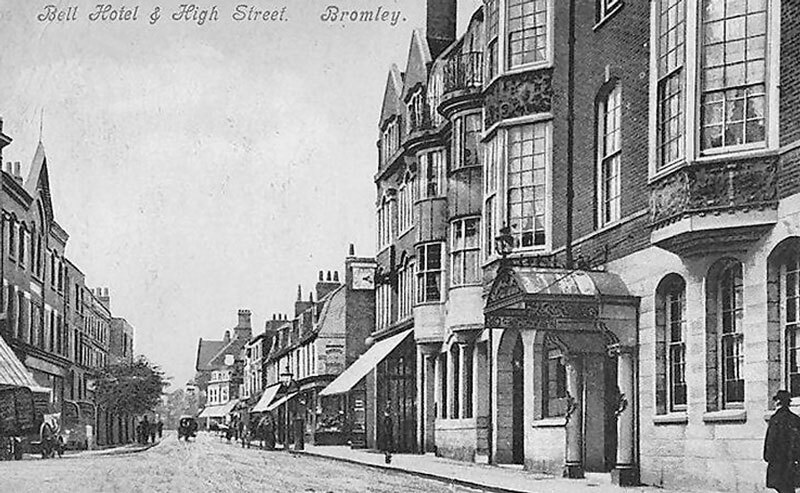 The Royal Bell has stood over Bromley High Street since it was rebuilt in 1898 on the site of an earlier 17th Century hostelry. The Grade II listed building as it stands today was designed by Ernest Newton, an important Arts and Crafts movement architect. For many years, The Royal Bell has been vacant, neglected, and has declined into a state of disrepair, with Historic England placing it on the ‘Buildings at Risk’ register. Recent conditions reports have estimated the cost to restore the former coaching inn to be in excess of £3million. 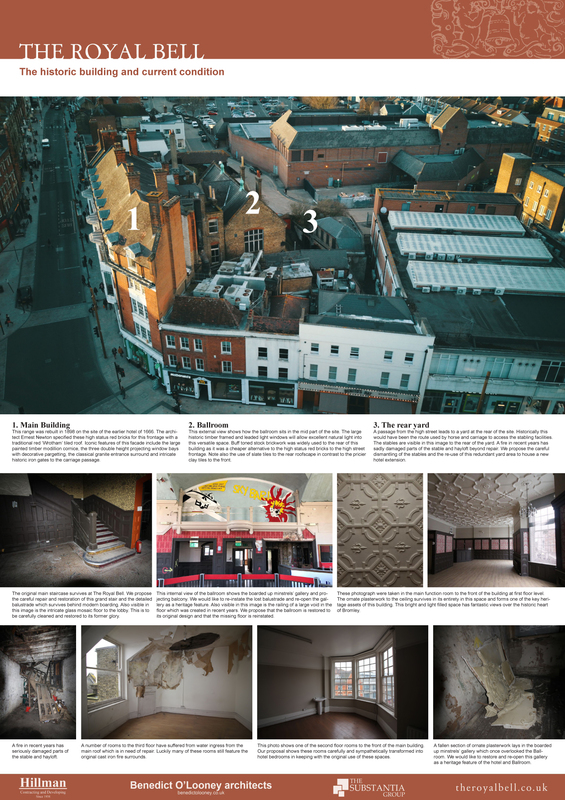 Local building and property development company, N. Hillman & Sons, have successfully acquired the property, through The Substantia Group, and are determined to restore the building to its former glory; returning Victorian Grandeur to the slowly decaying shell. 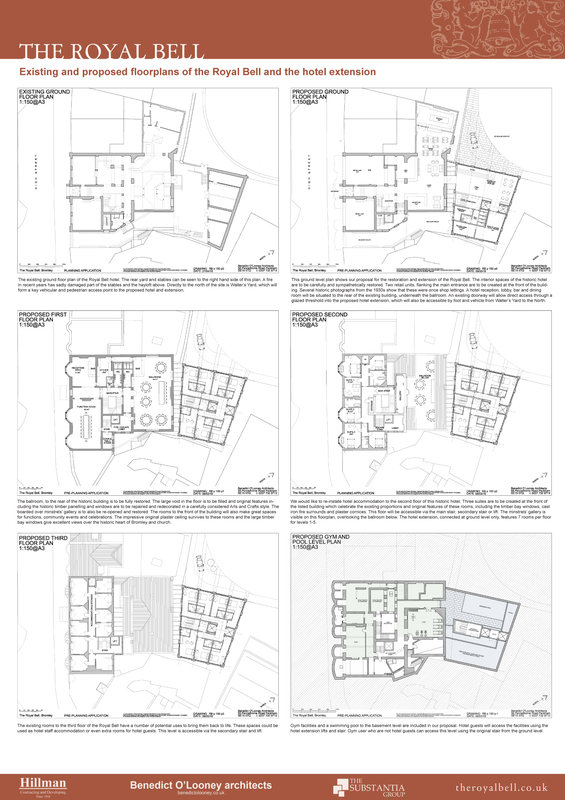 Hillmans have employed the acclaimed restoration architect, Benedict O’Looney to design a scheme that works sympathetically with the historic building whilst providing a commercially viable solution to safeguard the buildings future. The Bell at Bromley, a celebrated local landmark, has its origins in the 16th century. 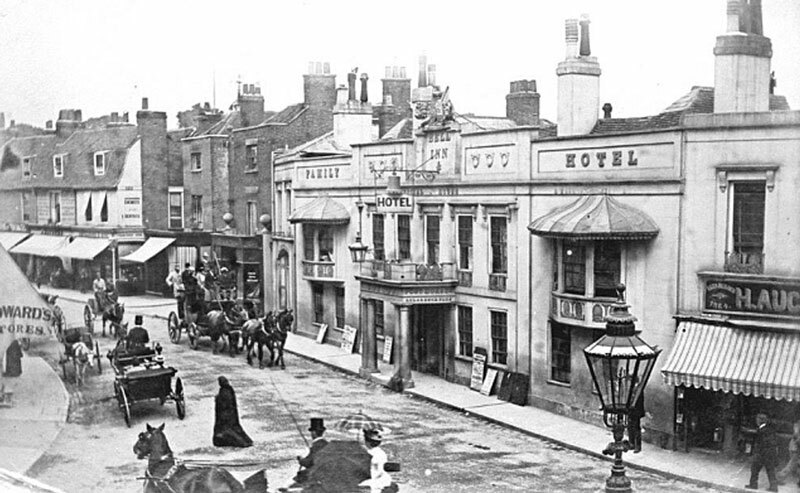 By the 18th Century, it was one of Bromley’s busiest coaching inns, with two stagecoaches running daily to and from London. As an important stopping point on routes from London into Kent and Sussex, the inn was celebrated in Jane Austen’s ‘Pride and Prejudice’, when the imperious Lady Catherine de Bourgh recommends that Elizabeth change horses at Bromley – “If you mention my name at the Bell, you will be attended to”. In 1898, coaches and horses had been replaced by the railway, and the building was completely rebuilt by Ernest Newton, an important local figure and prominent Arts & Crafts architect. The new luxury hotel was the largest of a trio of buildings that included a bank and a jewellers. 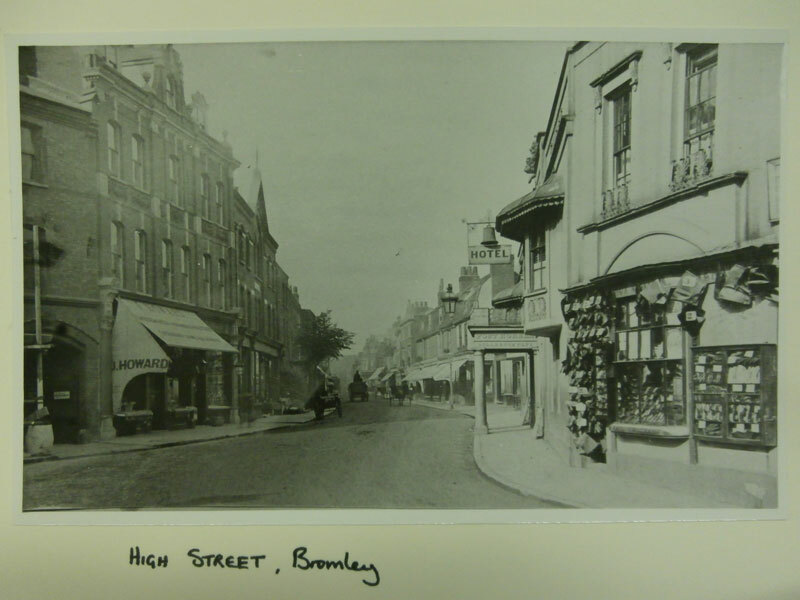 The grand urban streetscape, in a fashionable ‘Queen Anne’ style, reflected Bromley’s status as one of Kent’s most prosperous market towns. A much loved institution for local people for over a century, the formerly grand building latterly operated as a Bernie Inn, hosted a troubled nightclub called ‘Bromleys’, and the late-night ‘Sky Bar’. Today sadly neglected, the Royal Bell has stood empty and unused for over eight years. An inn called the “Bell” is referred to in parish records as far back as the Seventeenth Century. It grew over the years to be one of Bromley’s principal staging hotels. 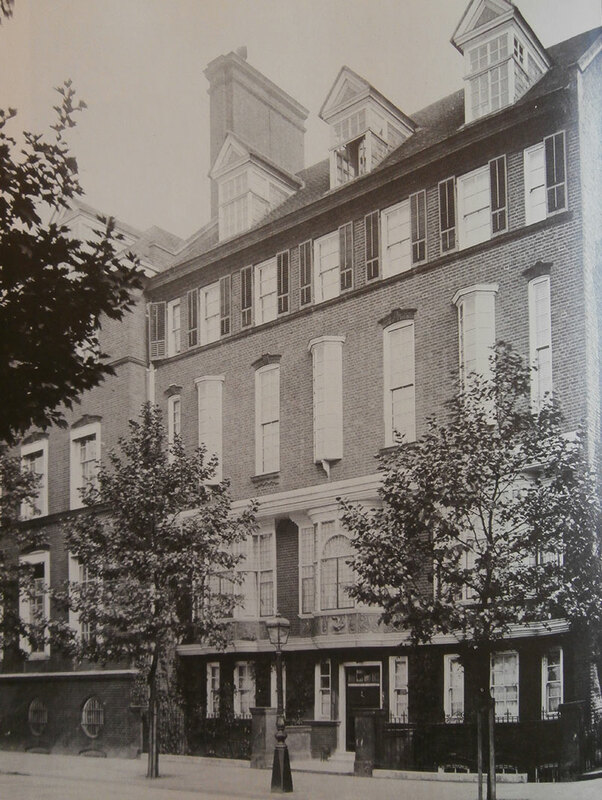 The building grew in a haphazard way, but by the early Nineteenth Century boasted a genteel regency frontage – the rear remained rather more humble. 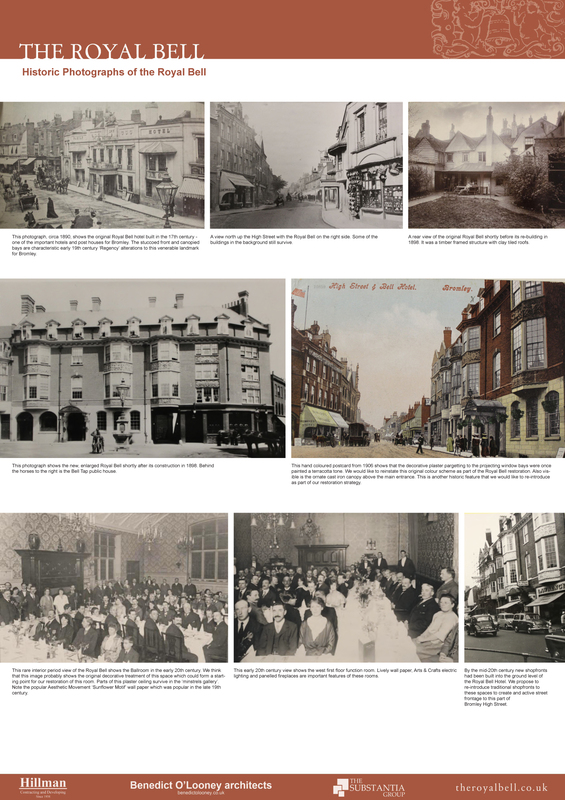 Both sides are captured in early photographs of the period, when the Bell was at the heart of Bromley’s social and political life. From 1847, the landlord was William Sutton. The building had the same scale and general appearance as the still extant Swan & Mitre at the other end of the High Street. 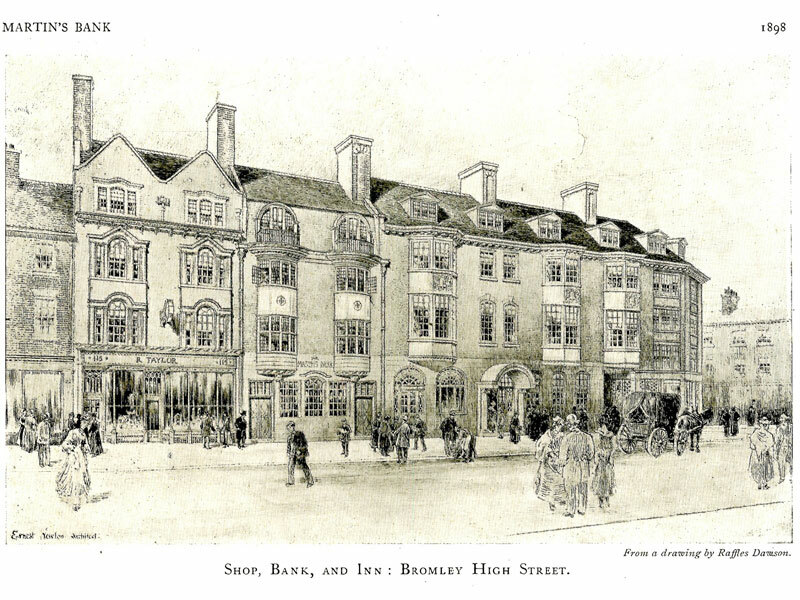 While visitors to Bromley stayed and took refreshment in its well appointed rooms, local working people would have drunk beer at the “Bell Tap”, an unassuming secondary building next door. By the 1890s the front of the Bell had to be propped up as it was in danger of collapse. William Sutton was succeeded by his son Frederick, but in 1897 the family negotiated the sale of the whole enterprise to Reid and Co Ltd, owners of London’s Griffin brewery. 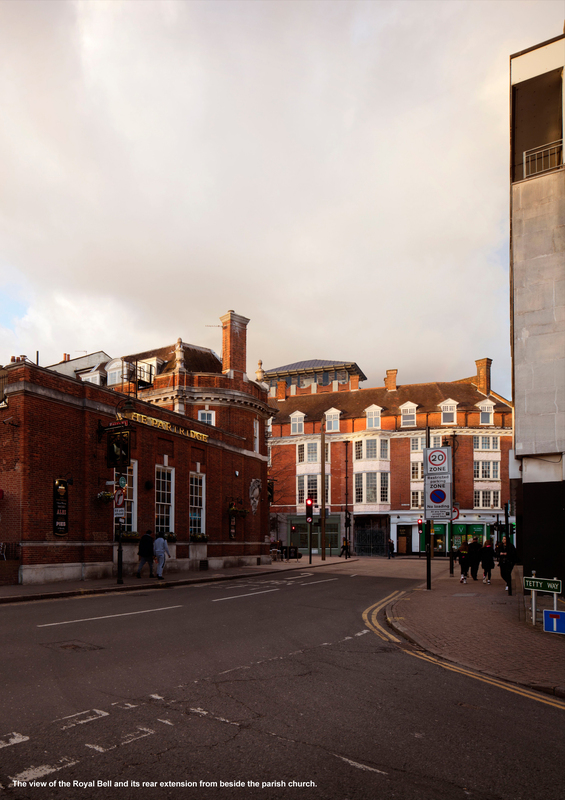 Reids began redevelopment of the whole site, replacing the coaching inn and the Bell Tap with a building better reflecting the prosperity of Victorian Bromley. Fittingly, the foundation stone for the new building was “laid” by William Sutton’s 1 year old grandson. 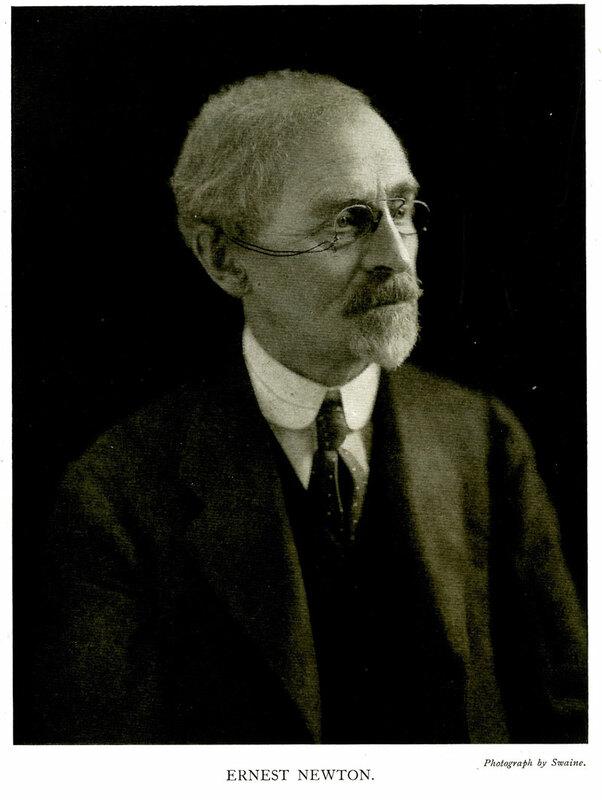 Ernest Newton was a prominent and influential architect at the end of the Nineteenth and the early Twentieth Centuries. 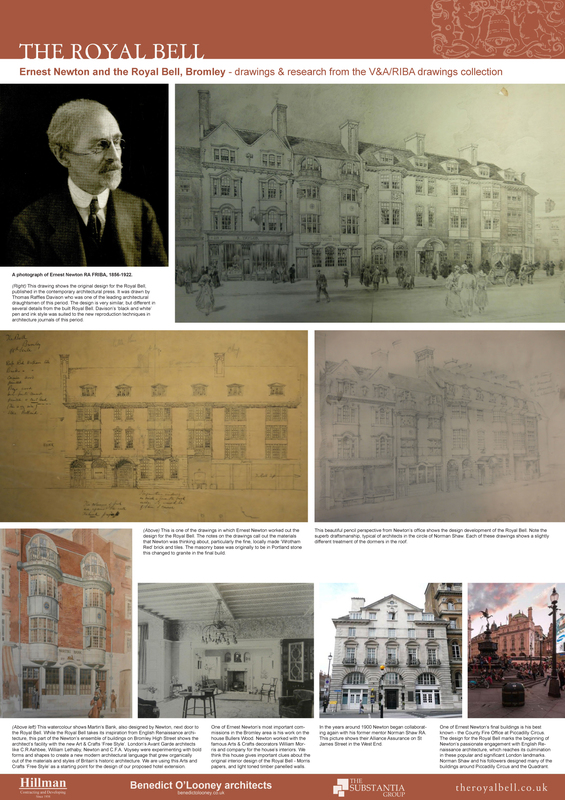 Born in 1856, he began his career in June 1873 as a pupil in the office of the celebrated architect, Richard Norman Shaw, and after undertaking a 3 years pupilage he became Shaw’s assistant for 3 further years, learning from one of the most popular and influential architects of the day. Setting up in his own practice from 1879, his buildings reflected these cosmopolitan and fashionable beginnings. He was the son of Henry Newton, an estate manager for the Sturt Estates in Hoxton. His father’s position, and Shaw’s extensive connections, gave Newton his earliest opportunities. With the acquisition of Bickley Hall by a land and development company in 1884, Newton’s father took on responsibility of developing the site, giving his son the opportunity he needed to grow his practice with new commissions. Here he would build the large middle class homes that established his name over the next ten years. 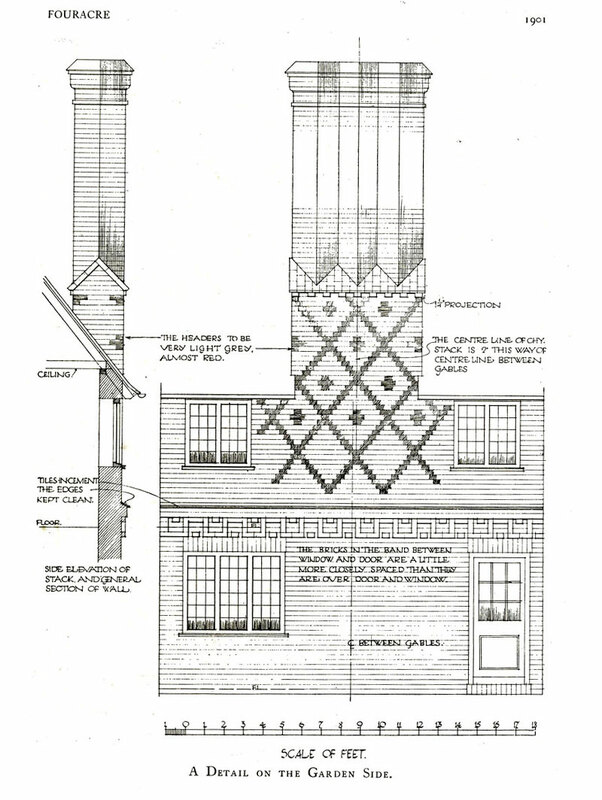 Deeply influenced by Shaw, he took up the fashion for red brick, tile hung, houses with attractive windows, adapting it for use in the burgeoning neighbourhoods of Grove Park, Bickley and Chislehurst. Along with houses, he built the churches, shops, pubs and meeting halls that completed these communities. Newton went on to be one of the founders of the Art Workers Guild, that highly influential body that promoted the Arts & Crafts movement, and was president of the Royal Institute of British Architects during the difficult years of World War One, where he coordinated the issue of building licences. Recognition of this important role can in the award of a Royal Gold Medal in 1918, and a CBE in 1920, while in 1919 he was made a Royal Academician. However, his dedication during the war years affected his health and he died on January 25th 1922 aged 65. In the 1860s, the fashion for Gothic architecture in England was on the wane. Richard Norman Shaw introduced into popular public taste a new style in reaction to Gothic, one which rejected medieval architectural features in favour of a distinctly English palette of red brick, small square panes of glass, white painted woodwork and red roof tiles. Just as the Gothic revival had been led by the polemics of Pugin, this new “artisan” style had a powerful advocate in William Morris and his decorating firm. The Red House, designed for Morris in 1859 by Philip Webb only five miles from Bromley at Bexleyheath, was the first manifestation of this new “Domestic Revival” style. Where Webb and William Butterfield led in the 1850s, others including Norman Shaw, followed in domestic work of the 1860s, and more attention grabbing public projects emerged in the 1870s, when the fashion rose to dominance in England. This new style, labelled “Queen Anne” after the English architecture of the early Seventeenth Century, was a reaction to the perceived moralising of Gothic. Also called the “Domestic Revival”, “Arts & Crafts” or even “Free Classical” it drew upon a range of sources including English, Dutch, and Flemish domestic buildings of the Seventeenth Century, the interiors of Robert Adam, and the artistic ideals of William Morris and his firm. It was sometimes formal and sometimes playful, rejoiced in red brick, scrolled ironwork, white woodwork, terracotta and plaster ornament. It delighted in asymmetry and breaking conventional rules of proportion. It was generally a “town” style, unlike the full blown Arts and Crafts fashion of the early Twentieth Century. It was immensely fashionable, defining the “look” of large parts of Kensington and Chelsea to this day, but was also employed for philanthropic buildings, particularly hospitals, fire stations and schools. The London Board Schools (built from 1872 to the early 1900s) were almost invariably designed within the movement, and represent its most extensive legacy, along with the prototype “aesthetic” suburb of Bedford Park (at Turnham Green, built from 1876). Norman Shaw was a generous employer and assisted his proteges in the development of their own careers. It is likely that he was responsible for introducing his former pupil to the Earl of Northbrook, of the Baring banking family. Northbrook became one of Newton’s first independent clients. The Earl’s father, Sir Francis, had bought the Manor of Lee in 1792. The area was progressively developed from the early Nineteenth Century, particularly after the arrival of the railway with Lee and Grove Park stations. Grove Park in particular was conceived as the opportunity to create a new “artistic suburb” much in the manner of Norman Shaw at Bedford Park. 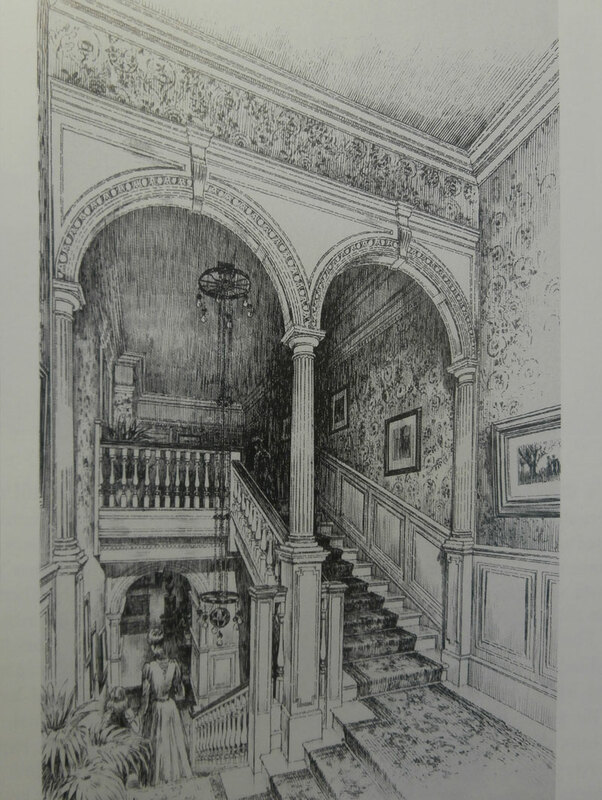 The choice of Ernest Newton as the preferred architect meant that it was destined to be more than a run of the mill speculative development on the edge of London; his talents and tastes had been guided by the very best of late Nineteenth Century architectural practice. 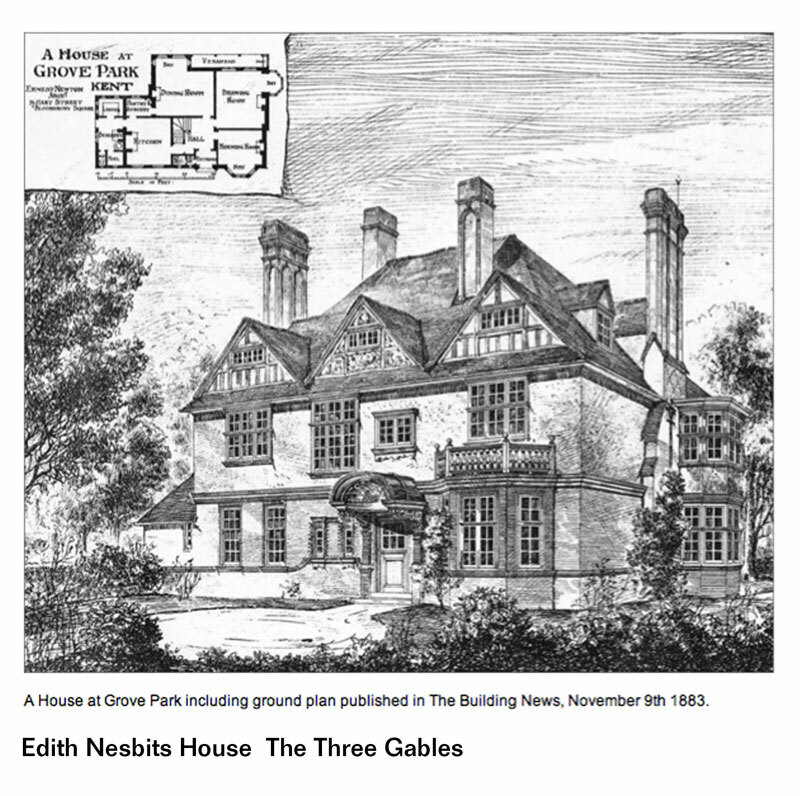 Newton designed a number of large villas at Grove Park, including “Three Gables”, the house that would be let by children’s author E Nesbit and her husband in 1895. 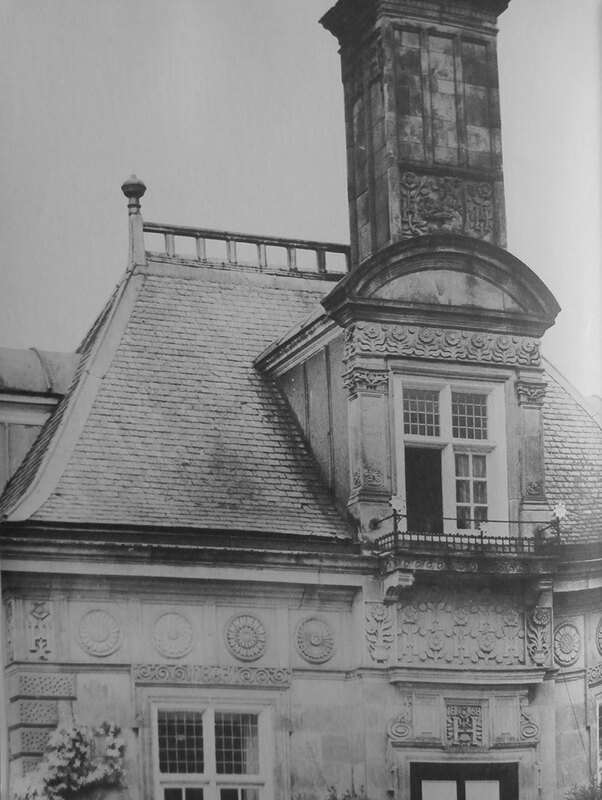 The house was in the best fashion of “Queen Anne” free styling, beneath the hipped roof, tall brick chimneys and titular gables (two half timbered, the central one pargeted), the fenestration was irregular and deep bay windows were thrown out from the principal rooms into the generous gardens. It was a suitably free and liberating backdrop for Nesbit and her circle, that included HG Wells and George Bernard Shaw. Whether just following architectural fashion or a real attempt to style a South London rival to Bedford Park, the efforts of Lord Northbrook did attract its share of liberals and free-thinkers. Newton also design the shops at the neighbourhood’s centre and the Baring Hall Hotel as one of the country’s first “improved” pubs, where moderate intake was encouraged by the provision of food as well as alcohol. Of all his work at Grove Park, only the pub survives today, thankfully saved from recent demolition by local campaigners. Nevertheless, at Grove Park, Newton established his refined architectural style. After 1884, development of the Bickley Hall Estate began in earnest as a high class commuter enclave. The South Eastern Railway’s new short route from St John’s to Chislehurst opened up the area to affluent Londoners looking for space and clean air. 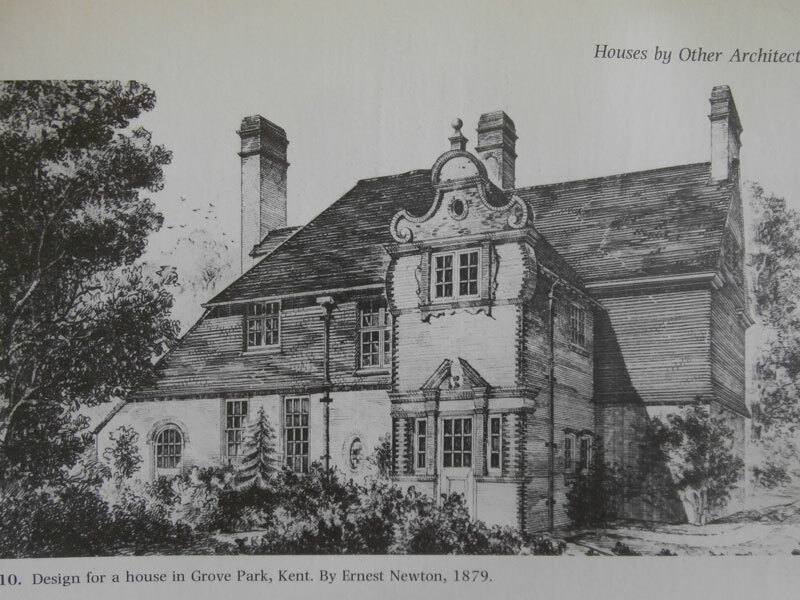 Numerous villas and large houses remain today in Bickley and Chislehurst as testament to this period, many of them designed by Newton, who had by this time established his office at Gray’s Inn, London. 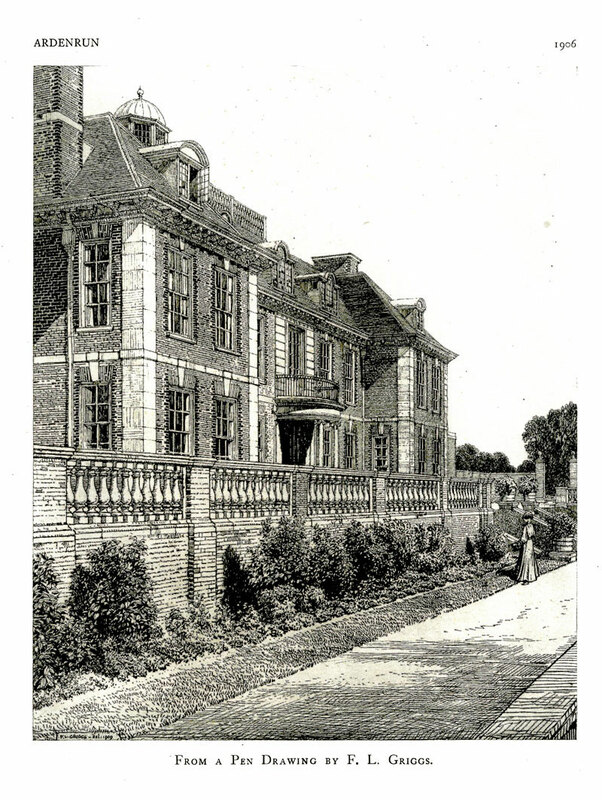 It was the remodelling of a house called Bullers Wood, in Chislehurst, for the Sanderson family, that gave Newton his first significant large commission in 1889. The house cleverly took advantage of its sloping site with a number of garden terraces, overlooked from a large drawing room decorated by Morris & Co. 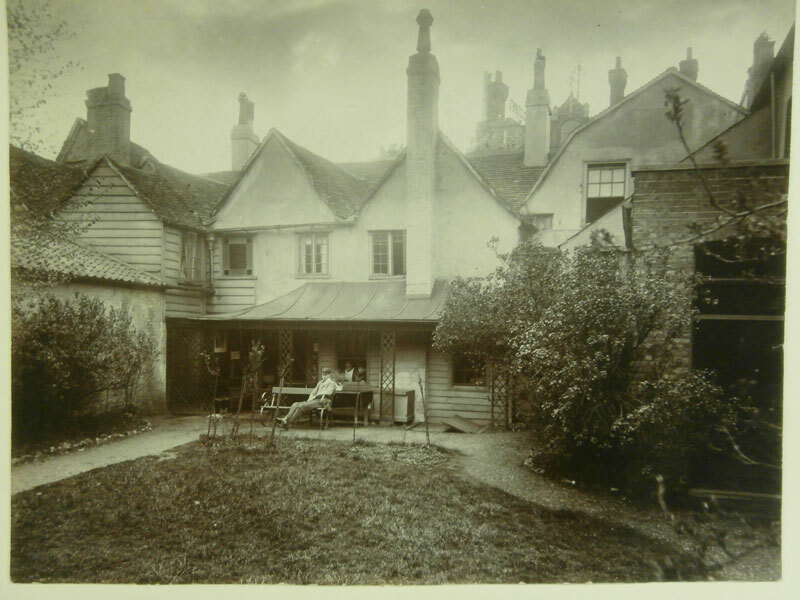 In Bickley, he designed Lyndhurst (No.8 Bird in Hand Lane) in 1884 for himself and his family. Newton had married Antoinette Hoyack of Rotterdam in October 1881 and they went on to have three sons. 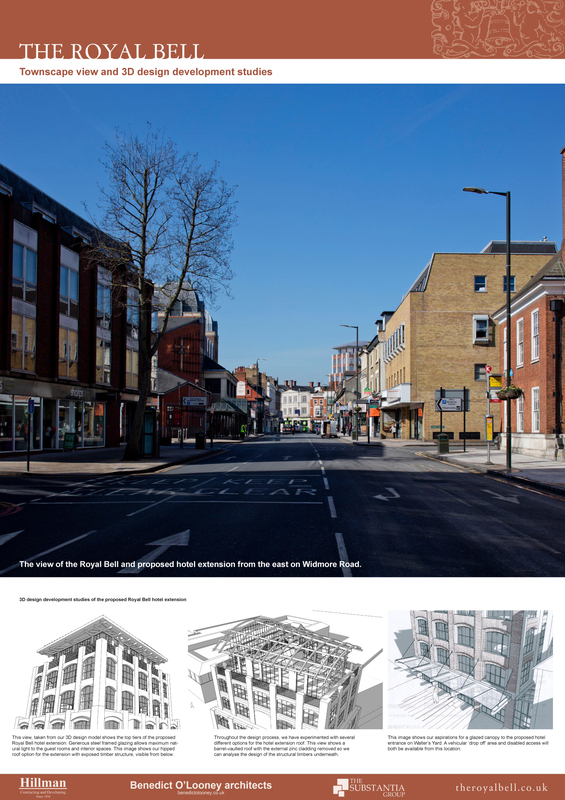 The new Royal Bell was an ambitious exercise to give Bromley a street that reflected its prosperity and proud urban character. Cole Childs had built the new Town Hall around the corner in the 1860s, its prominent tower representing a new scale for the town centre that the Bell had to match. At four storeys, it is double the height of its predecessor. The scheme incorporated not only a large new hotel for the railway age but also a branch of Martin’s Bank and a jewellery shop. 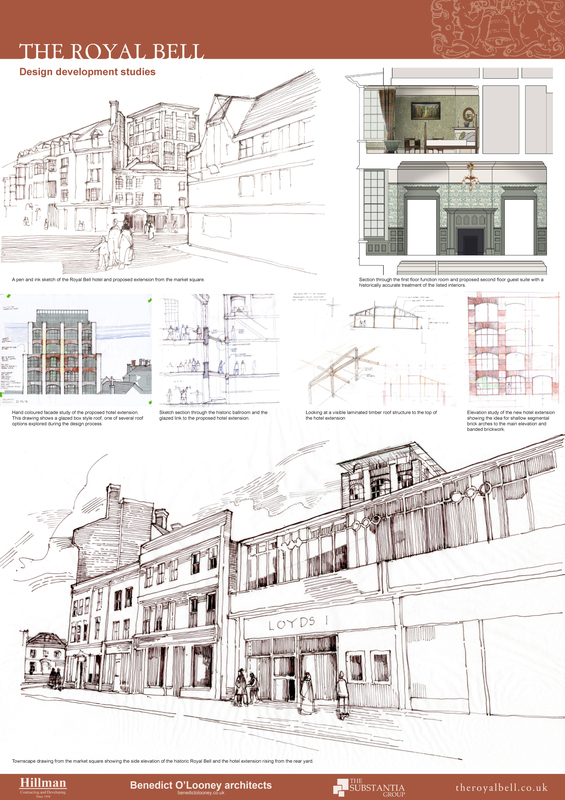 Each were given different stylistic treatments to create a sense of variety and an organic growth to the High Street. 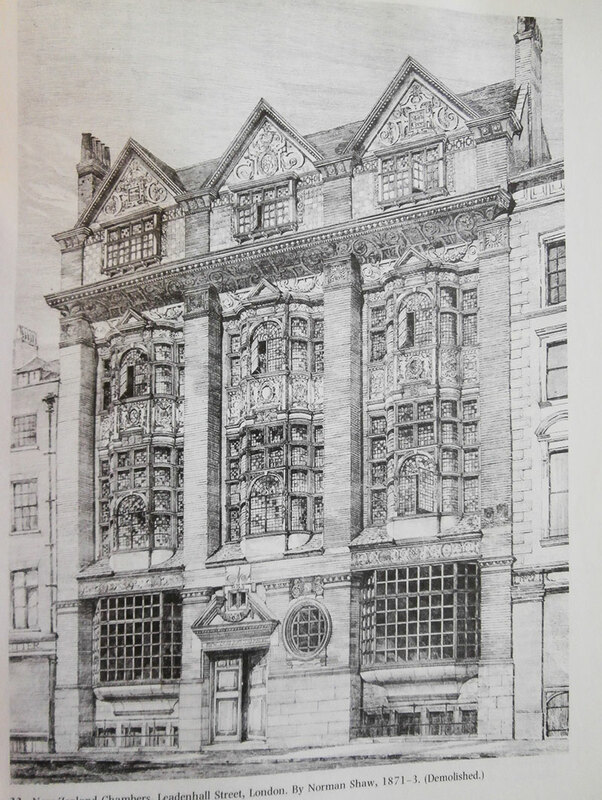 The bank was favoured with Newton’s beloved bow windows cased in ornamented lead, surmounted by curved dormer windows. The shop is neo-Jacobean. The Bell is in a domestic style, a granite faced ground floor with a fine red brick elevation above, surmounted by a wooden cornice in the manner of a “Queen Anne” townhouse. The prominent three sided bay windows are a typical Newton feature, marking the most important rooms, and are embellished with pargeted motifs. Above the cornice a row of long dormer windows pierce a brick parapet – these rooms were clearly upgraded during the design process, probably because they were to be additional guest rooms. The windows on the street elevation are small Georgian panes, while those at the rear are Victorian plate glass. The glory of the Bell is its enormous Ballroom,with decorative stained glass, on the first floor at the rear, and also its ornate function rooms overlooking the street; a grand staircase endorsed the new hotel’s high class status. Meanwhile the plans allowed for a reincarnation of the “Bell Tap” at the far right ground floor, with a separate entrance. 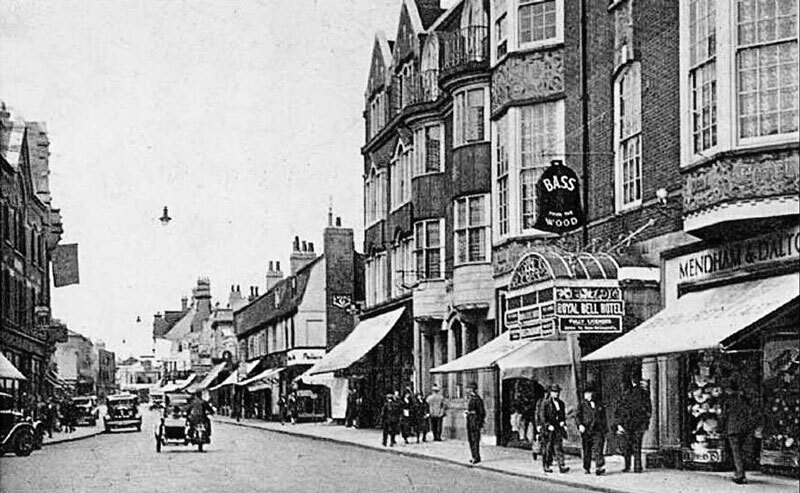 The plain gables at each end of the group suggest Newton intended his group to be the starting point of a grander High Street, an ambition that would be thwarted by the onset of the Great War. 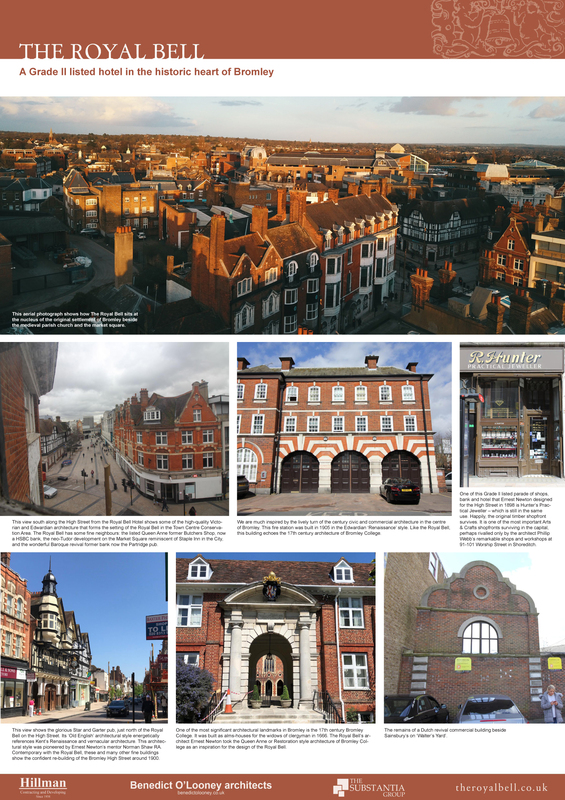 Nevertheless these fine civic buildings represent Newton’s most important non-domestic commission, and remain one of the finest local townscapes in the proximity of London. 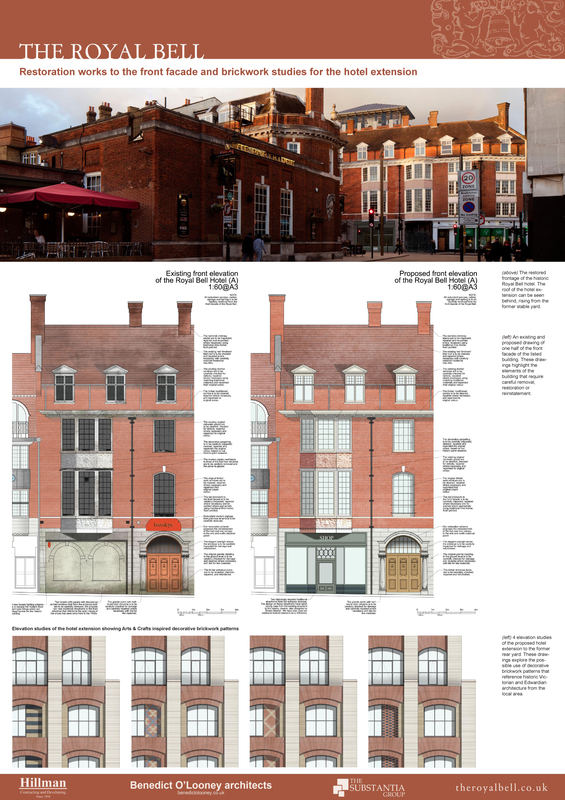 The only substantial changes are to the front of the ground floor, adapted in the 1930s to incorporate separate shops either side of the main entrance. The group was listed Grade II in 1973. Hillmans are dedicated to returning the property to its former Victorian glory, whilst introducing a scheme that is sustainable and that will safeguard the property’s future. 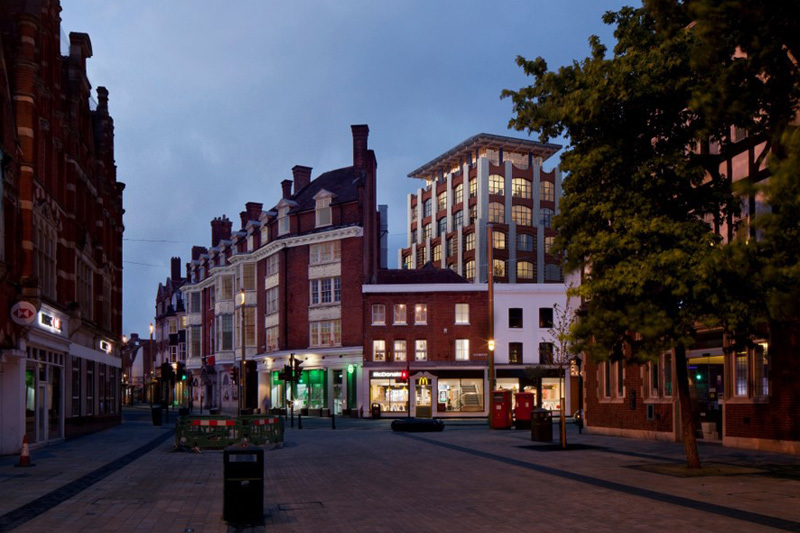 Hillman’s scheme will see The Royal Bell reinstated as a grand 5-star hotel and community hub. 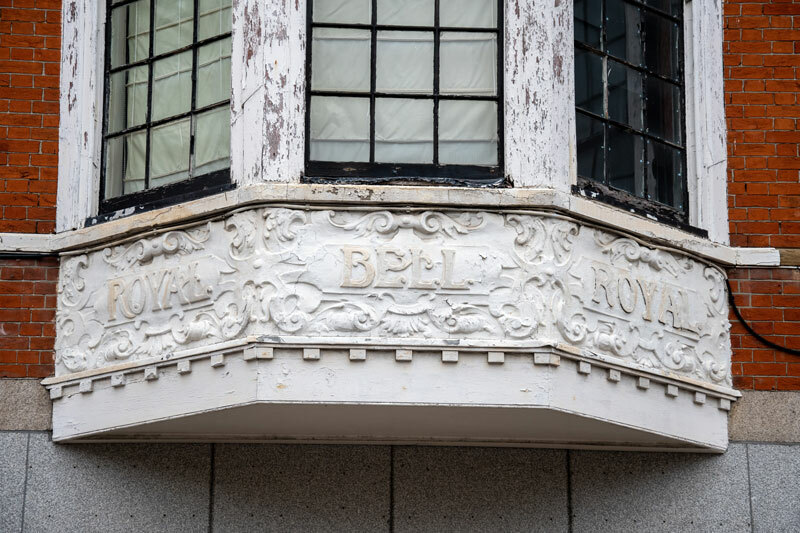 To ensure these plans, and to return the building to a working hotel that provides a viable solution to secure The Royal Bell’s future, the team is working with a Hotel specialist who is advising on the facilities deemed as critical by UK hotel operators. To run the hotel as a premium, 5-star rated hotel requires a minimum of 50 bedrooms with restaurant, function space and spa facilities. 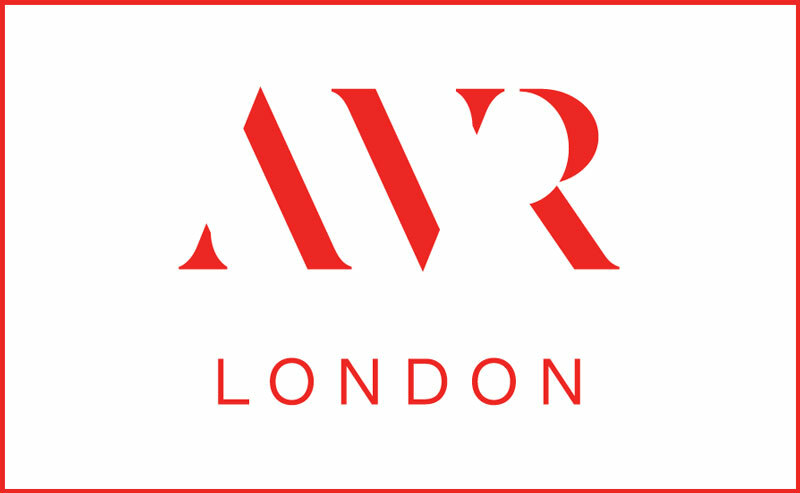 The ground floor will therefore house the Hotel reception, a restaurant and provide two commercial units, whilst the Basement will be renovated to provide a gym and spa, which will be available to both hotel guests and the public. The former Dining Room and Ballroom, on the 1st floor, will be painstakingly restored to their original grandeur and will offer function spaces which will be available for meetings, private hire and as a community facility. Guest bedrooms suites will be created in the upper floors of the historic building, and within a sympathetic extension to the rear. 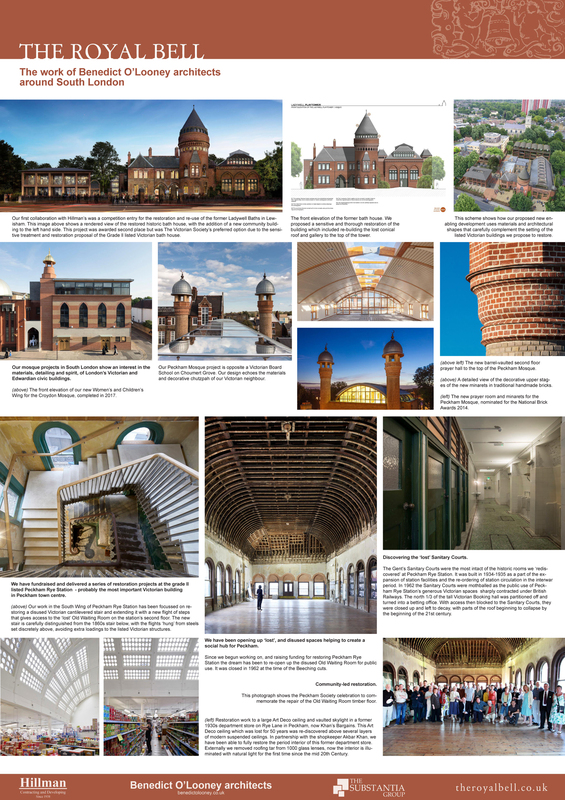 This development will see the historically important building not only protected from further decay, but painstakingly restored to its former glory. 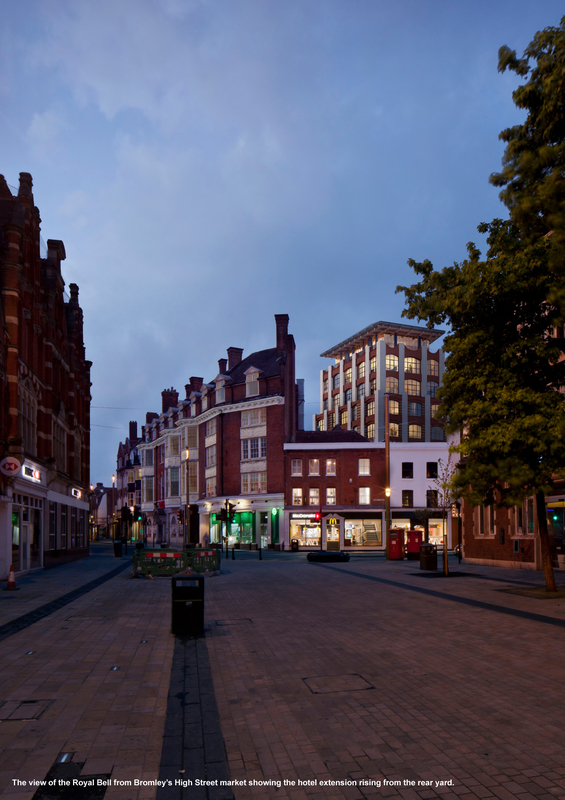 It is hoped that the introduction of a 5 star hotel on Bromley High street will help rejuvenate the area which in recent years has unfortunately become home to many empty units, for sale signs and charity shops. 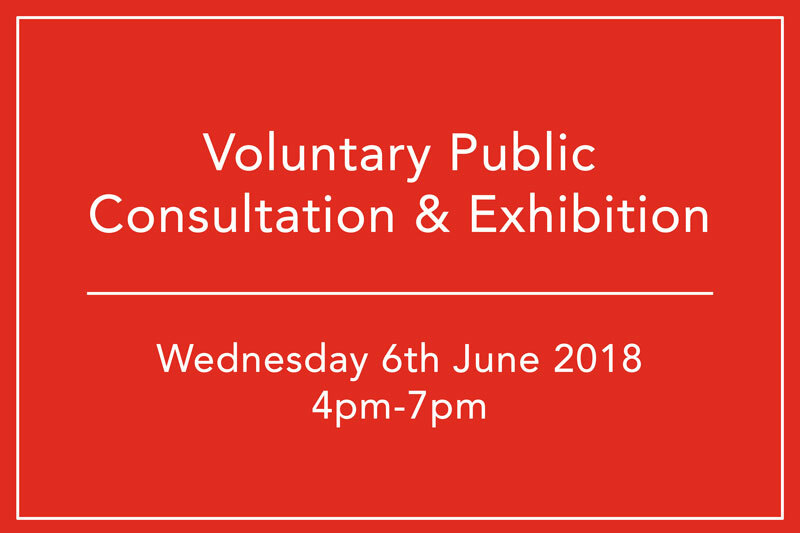 The Royal Bell Hotel will offer local artists and makers the opportunity to exhibit within the hotel, and local community groups will be able to use the function spaces. Hotel guests will enjoy the town centre location, making use of the shopping, dining and entertainment opportunities within walking distance. The property’s central Bromley location makes it perfectly positioned to once again operate as a hotel. Car parking, restaurants, shopping, cinema, theatre and public transport are all in easy walking distance. 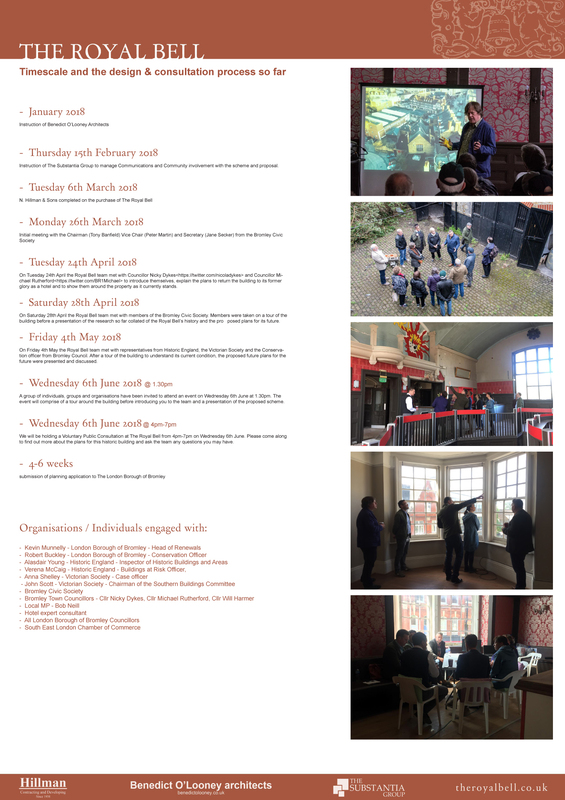 Do you have a story of times spent at The Royal Bell or photos of the building over the years, if so the team would love to hear from you, please email info@theroyalbell.co.uk or complete the below form to get in touch. “My father was born in The Royal Bell, and when I showed him the photos on your site, it brought back a lot of memories. 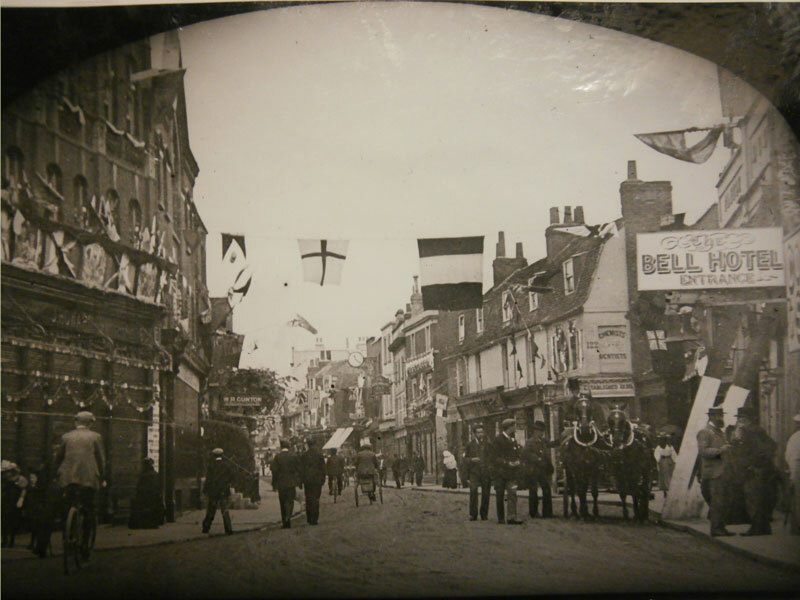 My grandparents took the tenancy of the Bell Shades pub in around 1926. 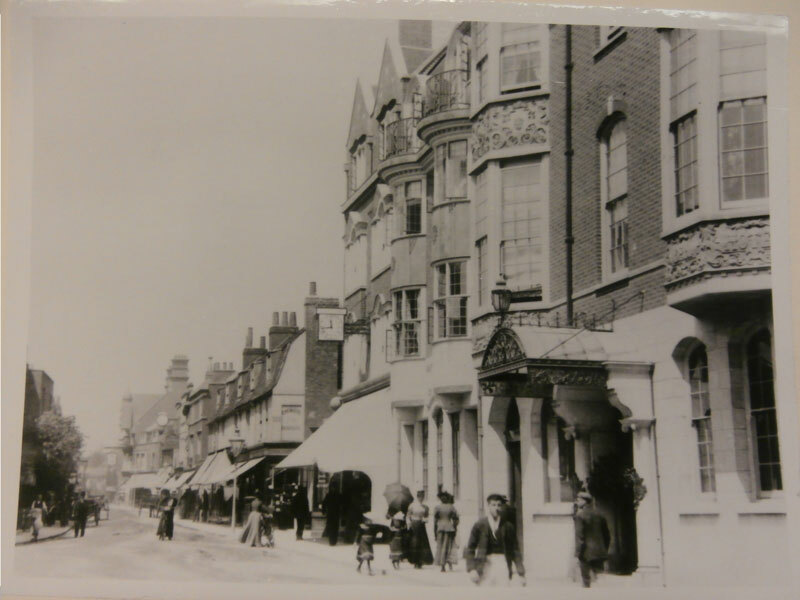 At that time, the building was split with the pub on the right, and the hotel on the left. My grandparents were newly-weds then – the youngest publicans in Bromley at the age of just 21 and 20. My dad’s brother, Bob, was born in 1927, and my father, Philip, arrived on 7 July 1929. He remembers the pub being very small, just a single room. His parents stayed there until he was six years old, when they all moved to the tenancy of the Chequers Inn, in Isleworth. He can remember watching a parade to celebrate the silver jubilee of George V out of the Bell’s upstairs window in 1935.